Thirteen months after buying our concert tickets, the night finally arrived. Late Tuesday afternoon, we arrived in Manhattan on the Amtrak and proceeded to make our way to Central Park's Summer Stage for the indie-rock concert event of the year. Rachel and I dropped our bags off at a friend of a friend's house. Then we grabbed Mexican food and margaritas with the friend of a friend (Dan) and his buddies Alex and Eric. Two of the three were from St. Louis, so I had lots to discuss with them. Then we met fellow DCites Fran and Morgan at the show. Oh yeah, who was playing, you ask? Pavement, who routinely land in my top three bands of all-time (along with The Beatles and Guided by Voices). They were in every bit as good a form as the handful of times I saw them before their breakup in 1999. 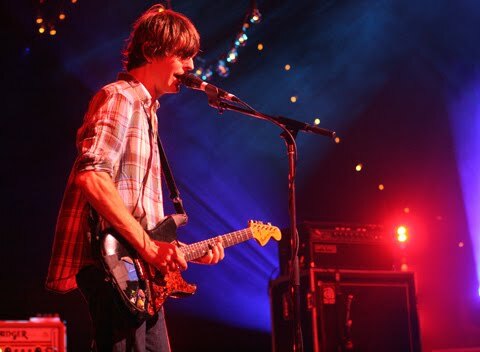 Leader Steve Malkmus exuded confidence in his unusually quirky vocal stylings and played guitar behind his back and hit chops that were like a cooler and looser version of a college-rock Jimi Hendrix. 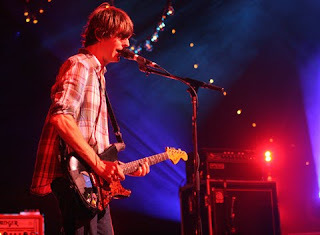 Several of the traditionally tight and concise Pavement classics were stretched into jammy territory, clearly influenced by Malkmus' post-Pavement band The Jicks. Where this probably worked best was with set closer "Stop Breathin'," which actually pulsated and sent waves of guitar dueling through the city reminiscent of the Pink Floyd concert I saw in 1987. Pavement can do no wrong, because even when they ventured into psychedelic jams, you knew it was never long before pop perfection would return. Particular highlights of the first of four nights at the Central park venue included "Gold Soundz," recently deemed by Pitchfork as the best song of the 1990s, "Box Elder," Stereo," Silent Kit," "Shady Lane, "Rattled by the Rush," "We Dance," "Perfume-V," "Debris Slide," "Trigger Cut," "Range Life,"and "Cut Your Hair." The only thing that could have been better would have been if the band played longer. For instance, the next night, they played several tunes that I would have loved to hear, including "Summer Babe," "Zurich is Stained," "Two States," "Lions (Linden)," Here," and "Father to a Sister of Thought." Pavement is one of life's grand pleasures. It's good to have them back again. Did you let Mr. Niu win the tennis game.....the host-guest China relationship? Your writings are so very inciteful and interesting. Thanks for sharing with those of us who are totally unknowledgable about Inner Mongolia. I think he got one set and we got the other.